So, here I am, talking about social justice on The Happy Arkansan. I never thought I would talk about social justice here, even though it is such a big part of my life. But, I think there comes a time when you have to make the best of the platform you are given. I tried to divide The Happy Arkansan and me, but I am The Happy Arkansan. I am The Happy Arkansan, and I am sticking up for social justice. When it comes to today’s movements such as Black Lives Matter a lot of people wonder how they can be an ally to the movement. It can seem like such movements don’t want participants who are not minorities, but I assure you, all movements want a variety of people to help them out. Allies are essential, and they help us get the word out about our movement as well as speed up the process by which our progress is seen. Being an ally is important. We need allies of all walks of life to help this movement move forward. 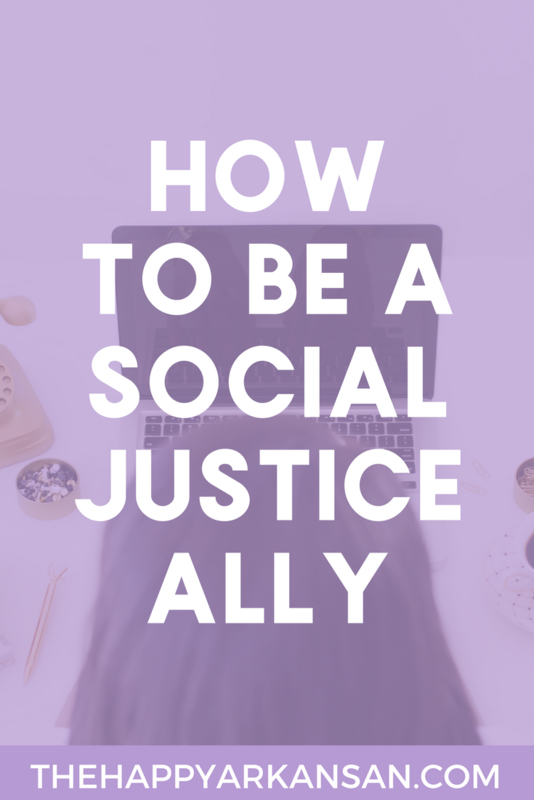 Here are my tips for anyone who wants to be an ally to any movement that deals with social injustice. Our stories will be different. Our stories may be vastly different from anything you can ever imagine happening to you. Do not judge. Do not think that the person you are listening to is lying about their experience. Listen, and listen a lot. Listen more than you speak. Listen to story after story. Do not try to make a million excuses or ask them if they had anything to do with the experience happening to them. Listening will make you a great ally because so many people fail to listen. So many people fail to truly and wholeheartedly listen to people of color when they tell their stories. Or people only listen to some stories and completely ignore the outcries of those stories that don’t appeal to them or their preconceived notions. Take all the stories at face-value, because they all have value. Some people will have nothing but amazing experiences in life. Some people will have a mix of experiences. Some people will have only negative stories to tell. My life has been a mix of positive and negative stories involving racism. Most of my stories are positive, and I don’t deal with a lot of racism daily. But I also have stories where I am profiled and watched in stores, or I have seen what profiling has done to my close friends and family. My stories may not match those of the Sandra Bland’s, Alton Sterling’s, Philando Castile’s, and Trayvon Martin’s of the world, but I have my own stories. When I share my stories too loudly or too boastfully I run the risk of taking on the stereotype of the angry black woman. This stereotype is something that I grapple with constantly and something that I try to avoid. I want my words to mean something and sometimes that leads me to mute myself so I don’t drown people with social justice. Lately, I have been talking despite this. I have been standing up despite this. I have been trying to live my whole complete self 100% of the time. This requires courage. At the end of the day, not everyone can live so authentically knowing that they may become the stereotypical Angry Black Woman/Man. At the end of the day, some people still close off their ears to me when I talk about certain issues. They still label me as just another Angry Black Woman and then move about their day. When I tried to be nice, I was judged. When I was outspoken, I was judged. As an ally, you have an awesome opportunity to speak the truth without being labeled as harshly. You can let your family and friends know about the plight of minority women, men, and children. You can speak to them in a way that I cannot. When I speak they may not hear my words. When you speak, you can change their viewpoint and way of thinking entirely. Tell the stories of people you listen to in your own way. Make this matter to other majority group members. Be an ally by being a storyteller. You have the ability to do great things for the minority population, just by speaking to your friends and family. When you talk to family, friends, and acquaintances, they may very well ignore you. They may have bigoted beliefs and make grand statements about who is to blame for certain things. They may just make a blanket statement about a whole group of people or a movement. If they do this, ask them to explain it. Don’t let any blanket statement go unchecked. When we let people get away with their blatantly wrong statements, they continue to believe those statements. They don’t question that maybe what they are saying is only a half-truth or a blanket statement. Ask them to give you a better answer than the one they are currently giving you. Ask them why they feel that way. Your goal at the end of the day is to have a conversation not a battle. Have a conversation with your family and friends. Give them facts and figures. Disentangle their facts and figures if they are wrong. Listen to them, let them get their arguments out, and actually argue with your facts. Don’t be so quick to fight with them. At the end of the day you may still disagree, but having a rational argument is much better. If you come at the conversation with a genuine love of wanting to spread correct information you may change someone’s mind or at the very least get them to see a different side to the story for a few minutes. 3. Vote & Hold Your Politicians Accountable. I know this seems like such a small thing, but seriously, voting can be one quick and easy thing you can do to be a great ally. Voting for people who care about civil rights issues and extending equal rights to everyone is so important in this day and age. So many of our laws and rules are under so much pressure to be taken away. Rules such as Voting Rights Acts and Affirmative Action policies which have been beneficial to minorities of all kinds. Als,o laws that take jobs out of the country, build more prisons and put more people in jail rather than trying to rehabilitate them or get them proper education. Laws that slash welfare while simultaneously adding more welathfare programs. Laws about drug legalization, healthcare reform, etc. All these laws and more will be on the ballot in some form or fashion soon enough. We need to make sure that these issues and more are voted on correctly. In November a lot of things will be solidified in this country. This could severely change the path that our country goes on for multiple years. The decisions that we make in November could potentially strip away many of the rights that we have in this country and leave a lot of people in vulnerable positions. Voting with our hearts is going to be really important. We have to make sure that the side that wins will look out for the rights of the minority populations across the country–whether it be the rights of racial minorities, LGBTQ+ minorities, women, children, etc. We have to make sure that the rights of populations with less say get the politicians they need. Once we elect those politicians, we have to keep them accountable for their promises and we have to offer them constructive criticism. You are allowed to criticize the politicians you elect if they are not meeting your standards. You are allowed to hold them accountable for the promises they make on the campaign trail. You must do these things so that your politicians keep up with the statements they made to you. If they were elected on these principals and ideologies, you are allowed to hold them accountable to them. One of the biggest things we need to focus on in the near future is making it easier for others to cast their ballots. You can easily help as an ally by getting people registered to vote, helping out with registration drives, hosting registration drives, etc. You can help by getting people to polls or helping others get absentee ballots, helping your fellow man by reminding them to vote and sharing your political opinions. A lot of voter disenfranchisement has been taking place lately and as an ally, you can help by making sure that votes are cast against these laws. As an ally, you can talk with your local congressmen and congresswomen to make sure that voting against voter disenfranchisement is high on their priority list. I put this close to last on the list because I understand that it is not always easy to protest. I have never attended a protest, although I would like to attend a protest one day. There are so many other things you can do to serve those you align yourself with. Protesting is a great way to do that. If you can find a protest in your area, I highly encourage you to attend that protest. Protests are important because they help us get our grievances out to the public. People may not always agree with the tactics used for change, but it is a right that we as Americans have to protests. I think protests are healthy on both sides of the political spectrum, and I don’t try to crush anyone’s right to a protest. Protesting can create a lot of solidarity and help you meet other social justice allies and friends. Protesting has helped shape and change a lot of things in this country. We must continue to stand up for the rights of people to protest and take their grievances in front of the American people. A lot of people are condemning protestors and demonstrators because of the perceived violence that comes from the protests, while also not discussing the issues that lead up to the protest. As an ally make sure that you get information out about what lead to the protest as well as the protest itself. Even if you cannot protest, as an ally you must fight this overwhelming urge that people have to put down and quell protests. Protests are important to our society. Not all protests are violent, and if they do turn so, we must think about the conditions that lead up to the violence. Violence, unfortunately, happens sometimes as these feelings of discontent with society spill into these protest. They are not the main goal of any protest, I can assure you of that. 5. Don’t Expect A Reward For Your Good Deeds. Lastly, allies, I must tell you–do not expect a reward for your good deeds. I am appreciative of your work on social justice issues whether they are in your home or during a protest. I really love that you are stepping out of your comfort zone and taking a stance on social justice issues. I cannot promise you a reward for this. Sometimes it is just back-breaking labor with no thank you or a cookie. Being an ally for social justice isn’t about the rewards and praise you will receive. It’s about being a decent human being and standing up for and with those who are oppressed. Do not ask for the spotlight or an award for your behavior. The truth is a lot of people within and outside of the struggle will never be praised for their work. Yes, there is a chance that you may be praised, but if that time never comes, continue to do the work that you set out to do. Be the change you want to see in the world. This is not a blog that I do often. I do not usually cover social justice issues on my blog at all. I am a sociology major but I am usually very private on my thoughts on these issues because I didn’t want to be divisive. But I am a divisive person. I am here to stand up for the rights of people across this country, across my state, and make a stand. I can no longer just stand by while my biggest platform for change is under-utilized. I have built a community here and I want to share all of me. I want to share my sociological, liberal, and progressive side with you all. I know that this may rub some people the wrong way but I ask that you hear me out and continue reading the blog. I appreciate all of you so deeply. Know that I have sat on my hands about social justice and tried to use other methods to talk about this but at the end of the day The Happy Arkansan is my biggest platform and I’d be a fool not to use it. I could not agree more with all the points you touched. I’m glad you found the courage to write about this on your blog. That’s more than I could say. Thank you so much for your sweet comments Yvanne! I really appreciate them! Such a great post! I absolutely agree with you. I love this! My heart breaks for communities I am not a part of, but I never know how best to support them. Thanks for sharing your tips for being a good ally, and thank you for having the courage to write about the important things on your blog! Love it!